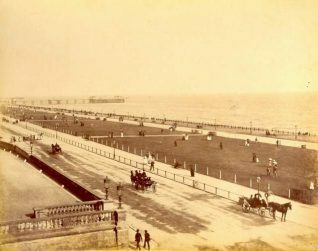 Brunswick Lawns, c. 1905: Brunswick Lawns looking east from the entrance to Adelaide Crescent towards the West Pier. People are promenading along the lawns while horse-drawn carriages travel along Kingsway. c) HOVE TODAY: Very few buildings in the borough of Hove date from before 1825. No pre-nineteenth-century buildings at all remain of the former village of Hove as the thirteenth-century Church of St Andrew was almost wholly rebuilt by George Basevi in 1836. Hangleton and Portslade churches are medieval, but there are scant remains at the other ancient parish churches of Aldrington and West Blatchington . Hangleton Manor is a grade II*-listed building of the sixteenth century with the eighteenth-century Benfield Barn standing nearby, and there are also a number of pre-nineteenth-century houses in Portslade village. Conservation areas have now been designated at The Avenues, Benfield Barn, BrunswickTown, Cliftonville, Denmark Villas, The Drive, Goldstone Pumping Station, Hangleton , Pembroke and Princes, Portslade Village , Tongdean Avenue and Tongdean Road, and the Willett Estate. Since the early nineteenth century the Hove authorities have always strongly resisted Brighton’s several attempts at annexation, and, although the two towns are always thought of as one by outsiders, ‘Hove actually’ maintains its independence as a quiet and genteel town, a ‘distinguished resort’, in contrast to its brash, cosmopolitan neighbour. 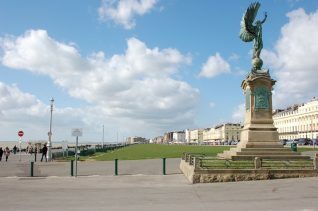 The difference is obvious when one looks at the respective sea-fronts, the Brunswick and Western Lawns of Hove providing a complementary facility to the mainly commercialised promenades of Brighton.